Prabal is back again with a latest trick with the help of a great hacker kemi to get 2 GB 3G data for one night and 1 Gb 3G data for day (validity 28 days). This Trick is First on net and I am going to tell it to everyone. This trick is confirmed working in Madhya Pradesh.No information about other states because this is the latest trick. So just try in your state gudluk. ∆ Balance above 100 rs. 1. First of all activate night cash back scheme by dialing 55555. 2. Subscribe Rs 9 Unlimited validity pack ( by subscribing this pack You will get 12 MB 2G/3G/4G data). 4. Go to download a big file above 100 MB..... When the file starts downloading suddenly pause it. 8.when you successfully activated your 43 rs pack of 1 GB 3G night data. Resume the downloading of big file that you have paused. 10. At last when u have left 100 Mb 3g data you will get a meeseege that You have left 100 Mb data. 11. Again subscribe the 43 rs. 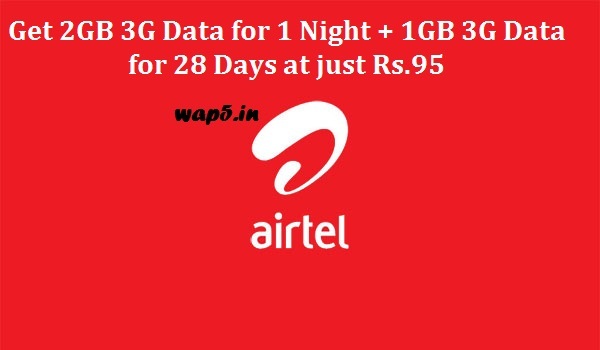 Pack for 1GB night data. By dialling *129# and selecting night store. 12.Finish all the data by downloading any movie or games. 13. After finishing your whole data just discomnect the internet and go for a good sleep . Is equal to (12 MB +1 GB +1GB)÷ 2 = 1GB 6 MB 3G. 1.Do not disconnect your data connection if u lost ur data connection u will not get 1GB 3G for 28 days. U will get only 2GB 3G for one night. 3.Take full precautions that your unlimited validity pack should not be over before activating rs. 43 pack. Don't blame me if u don't. Get your cashback. It will works 100% If u use it perfectly. ωιтн ρяαвαℓ αи∂ ωαρ 5.